Iron chlorosis is a major tree-health issue found throughout the state. This document summarizes the biology and ecology of the issue, including susceptible species and soils most likely to create this problem. Soil treatments and stem injections are discussed. 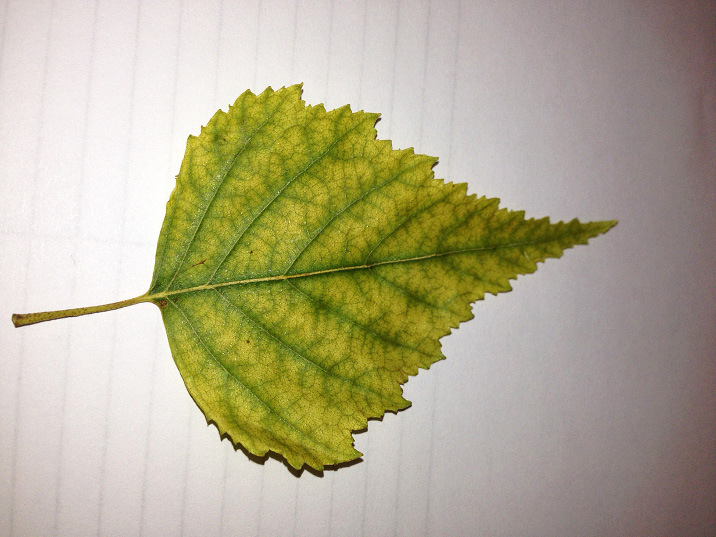 Iron chlorosis is a common tree health issue found throughout North Dakota. Trees are unable to absorb enough iron from the soil to meet their nutritional needs. North Dakota soils usually contain sufficient levels of iron, although not always in a form that is available to the plant. The problem is most common in soils with high pH (7.5 or higher), and it commonly is associated with the presence of lime (CaCO3) in the soil, or where soil compaction or poor drainage are problems. Some of the more sensitive tree species include silver maple, Freeman (hybrid) maples, Amur maple, river birch, swamp white oak and eastern white pine (Table 1). Ornamental shrubs and fruits also may be susceptible to iron chlorosis. The first symptoms of iron chlorosis are yellow leaves with bright green veins (Figure 1). If iron is lacking in the leaves, they will not be able to produce chlorophyll, the green pigment that provides energy for photosynthesis. Iron-deficient leaves can be scattered throughout the tree or whole branches can be affected. If left untreated, the leaves may appear white and then begin to turn brown or black at the edges. This will be followed by branch dieback (Figure 2) and eventually the entire tree will die. Be cautious when diagnosing this disease because leaf yellowing may be caused by a number of factors, including diseases or overwatering. 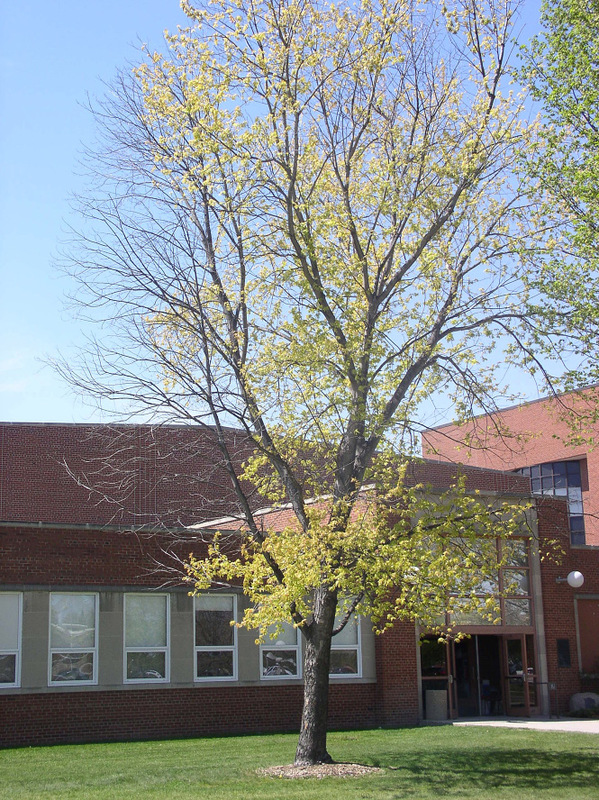 Additionally, some cultivated varieties are bred or selected to have yellow foliage (for example, Sunburst® honeylocust, Gleditsia triacanthos var. inermis ‘Suncole’). Iron chlorosis is quite difficult to treat. The best preventive measure is to avoid planting those species sensitive to iron chlorosis when installing a new landscape. Additionally, sensitive trees and shrubs should not be planted in low areas. Drainage must be improved on soils prone to water ponding. 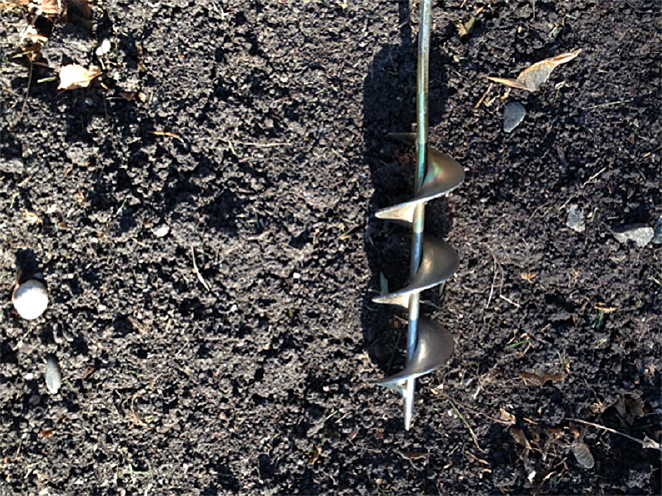 If soils are compacted, aerating them as needed will help reduce the severity of the problem. If high soil pH is suspected, soil testing is recommended to determine the scope of the problem. Your local NDSU Extension Service agent can provide sample bags and guide you on how to take a proper soil sample. The NDSU Soil Testing Lab also has instructions on how to collect a proper soil sample. The soil sample should be lab-tested for soil pH and home-tested for lime (CaCO3) content. Most soils giving rise to iron chlorosis will have a pH above 7.5. To check for lime in the soil, place 2 tablespoons of household vinegar in a container at least 1 cup in volume. Add approximately 1 tablespoon of soil and let the vinegar wick into the soil. Look or listen for fizzing in the soil-vinegar mixture. If the soil fizzes, lime is present, and lowering the soil pH (described below) is unlikely to be an effective treatment. Where lime is not an issue but high soil pH (greater than 7.5) is the underlying cause, many treatment options are available. Each treatment has shown varying results in research trials, and each has its advantages and disadvantages. If one treatment doesn’t work well, homeowners are encouraged to try another. Soils amendments can be used to acidify the soil. Lowering the soil pH is difficult, and results last only one to three years. Elemental sulfur is relatively inexpensive but will take several months to a couple of years to take full effect. Soil amendments such as sulfur must be incorporated into the soil around the tree or shrub. Treatments should extend beyond the dripline, or the edge of the crown. If bare soil surrounds the tree or shrub, apply at the rate indicated in Table 2 and rake it into the soil. Sulfur amending can be difficult to do if a lawn surrounds the tree because of the potential for lawn damage and the difficulties of incorporating the sulfur into the soil. One method is to core aerate the lawn around the tree in the spring or fall and then apply elemental sulfur in increments of no more than 0.5 pound/100 square feet per application. The sulfur should be watered into the soil thoroughly. Additional applications may be made in the spring and fall in conjunction with core aeration until the full amount listed in Table 2 has been incorporated. Do not apply sulfur to lawns in the summer because high temperatures increase the possibility of the grass blades being burned. The addition of elemental sulfur to acidify the soil is more effective for loamy or sandy soils than for clay soils. For clay soils, drill a series of holes in the soil around the affected tree and backfill them with a combination of sulfur and iron-containing fertilizer. Holes should be 1 to 3 inches wide and 12 to 18 inches deep. They can be drilled with a bulb auger or similar electric drill attachment (Figure 3). Use a mixture of equal parts elemental sulfur and granular iron sulfate (20 percent iron) to fill the bottom 8 to 14 inches of the holes. Place soil back into the top 4 inches of the hole to allow for turf growth. The holes should be spaced in a grid every 2 to 3 feet throughout the area covered by the tree’s root system. At a minimum, this will include the area under the canopy of the tree and go as far out into the lawn as possible, up to three times the height of the tree. Avoid damaging tree roots if possible. Before drilling these holes, contact North Dakota One Call at 800-795-0555, 811 to make sure that all utility lines are clearly identified. For shrubs, apply the sulfur/iron sulfate mixture by digging 4-inch-deep trenches 12 to 24 inches from the base of the shrub. Be careful not to sever any roots during digging. The trench should be filled to the depth of 1 inch with the mixture and then backfilled with 3 inches of soil. Ammonium sulfate can acidify the soil, but it also will add extra nitrogen, which can cause excessive growth. Aluminum sulfate is not recommended because of the potential for aluminum toxicity. EDTA — keeps iron soluble at pH of 6.3 and below. Not recommended for North Dakota. DTPA — keeps iron soluble at pH of 7.5 and below. Use only in specific situations. Chelated iron is easier to apply than elemental sulfur because it may be applied as a soil drench or a granule and watered into the soil. Late winter/early spring before the trees break bud is the best time to apply chelated iron. See the individual product label for additional instructions. Iron can be implanted or injected directly into the tree’s stem. 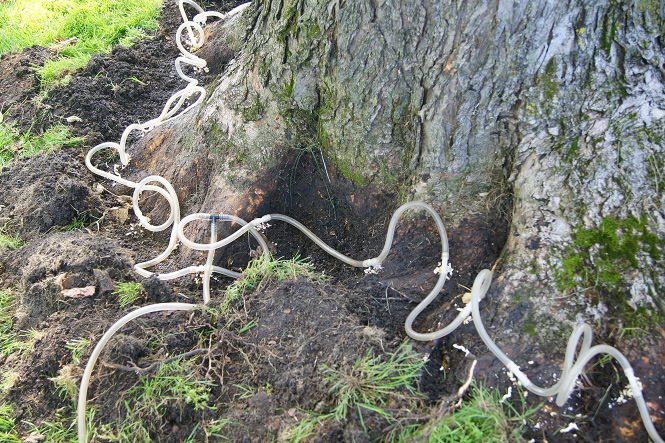 Both methods involve drilling into the tree, ideally in the flare roots near the soil line (Figure 4). The size of the hole depends on the treatment system that is used. Treatment sites are generally 4 inches apart, with holes drilled approximately 1 inch into the sapwood at the root flare of the tree. Trees should not be treated more than once per year, nor more than two years in a row. Take care when re-injecting a previously injected tree. Avoid drilling near past wounds because the old injection site may not allow for acceptable uptake of treatment products. Greener foliage often is seen within a month, and the effects may last up to two years. Ideally, treatments should be applied before midsummer. Implants are available as gelatin capsules containing powdered iron or an iron solution (often ferric ammonium citrate). The amount to use depends on the size of the tree; follow all label directions. Implant capsules are available at many garden centers or through online vendors. Injections place an iron solution into the stem via pressurized containers or under a pump system; an example is shown in Figure 4. While a number of injection systems are available to homeowners (Table 4), many professional tree care companies offer stem injections as one of their services. Ferrous sulfate or chelated iron solutions can be sprayed directly onto leaves of affected trees. These treatments generally provide very quick results and green-up often is seen within two weeks. However, only those leaves present during the treatment period are improved; new leaves produced later in the growing season are likely to be chlorotic. Foliar treatments must be repeated every year or more often. To prevent burning of the foliage, apply foliar treatments during cool weather or during the evening. Foliar treatments are easiest for shrubs and small trees. Large trees may require one of the other methods described above. If the iron solution falls on concrete or paved surfaces, it may stain them permanently. Should staining occur, immediately rinse the area. Iron chlorosis is found throughout much of North Dakota. Its severity varies from one location to another and among different tree species. Iron chlorosis is generally a manageable problem if diagnosed promptly and treated. However, if a tree is in major decline because of iron chlorosis, removing the tree and replacing it with a more tolerant species may be the best option. Prevention, by selecting the proper tree for the local soil-site conditions, is easier than treating the issue after the fact.